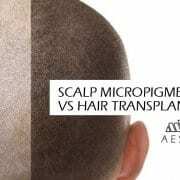 Scalp micropigmentation vs hair transplants: What’s the best solution for bald or thinning hair? Suffering with hair loss or thinning locks can be detrimental on your self-confidence. As much as we’d all like to ‘grow old gracefully’, sometimes the person in the mirror is not quite the person we want to be. Thanks to new innovations and technology, we can now maintain our good looks and self-esteem, even when age does start to catch up with us. https://www.mw-aesthetics.co.uk/wp-content/uploads/2017/08/scalp-mcropigmentation.jpg 525 1000 Marek Waclawczyk https://www.mw-aesthetics.co.uk/wp-content/uploads/2018/10/MW-AESTHETICS-LOGO-2018d.png Marek Waclawczyk2017-08-28 12:47:492018-11-20 12:37:38Scalp micropigmentation vs hair transplants: What’s the best solution for bald or thinning hair?